I have a male German shepherd, Tanning, which is 4 years old now. It is a very intelligent dog. I used to be with him at least two hours a day. 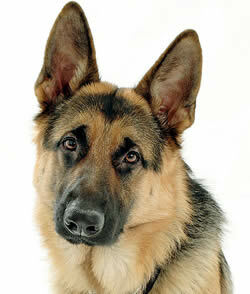 The German shepherd dogs are very courageous and active dogs. They must be looked after very carefully. The first thing I used to do in every morning is to unchain him and let him to go to the back yard for defecating. It takes his lavish own time and will be back after 10-15 minutes. Once he comes back, I feed him with milk and bread. He will also be given calcium tablets and he will be ready for a morning walk with me. I take him out on the road and we will walk 3 kilometers. He has been taught to walk behind me and he never walks in front of me pulling the lash. Exercise is necessary for these types of dogs otherwise, they will become lazy. Once he is back from walk at around 8 AM, I feed him with 200 grams cooked beef with some cooked vegetables. Then the next feeding time is at 12 noon. At this time he is given rice and curd mix with vitamin supplements tonics. At 4 PM he is given 200 ML milk with biscuits. Around 5 PM he is let free to play with me. Mainly we play ball. I will throw the ball away and he brings it back every time. I make him to run behind me for quite some time. All together, it will take 45 minutes. Around 7PM he has been given with quarter KG boiled chicken adding little salt, pepper powder and turmeric powder. Then he is left open and will be roaming around in the back yard another one hour. He will finish all his routine by 9PM and will be back in the cage. I used to bathe him every after 15 days by applying dog shampoo and scrub him. I use a lot of water to bathe him and he enjoys the bath. After bathing, I used to cut his nails. Be careful to cut the extreme tip of the nails only. Otherwise, it will bleed. What a "Primo Chulo". Take care of Tanning and in return, he will take care of you.